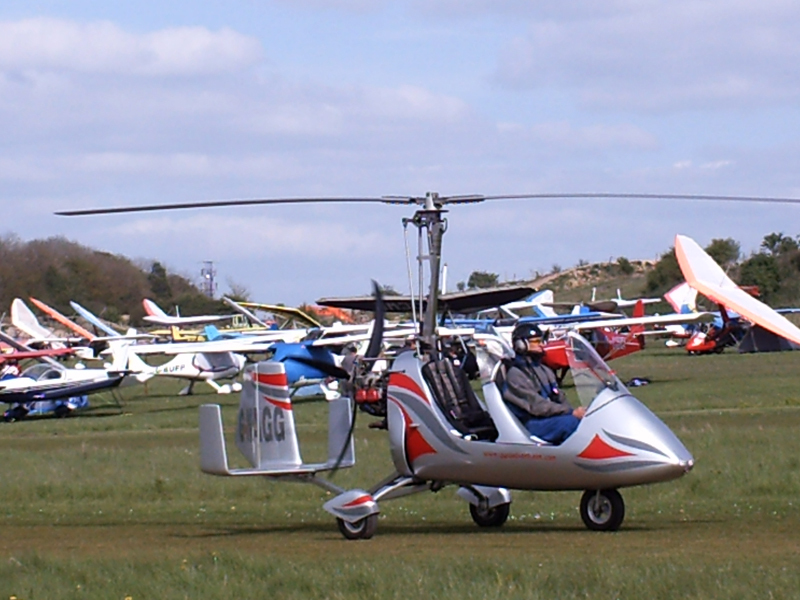 Saturday 2nd of May dawned, the weather forecast was good and I was planning to fly down to Popham in Hampshire (South of Newbury towards Southampton) for the annual Popham Microlight Fair. First a quick trip to Halfords to get another Jerry can as I needed more fuel than I had cans for ! But by 1130 I was fuelled up with 60 litres on board (should be enough for 4.5 hours ish, still getting used to the fuel burn on CBLX as not had her long), checks done and roaring down runway 13 at Kemeys Commander and up into the sky towards Newport and the Severn Bridges. The Welsh side of the estuary was quite cloudy and hazy and a bit bumpy but the sky ahead on the English side was clearing into blue with little white fluffy clouds dotted about and the overall forecast was fine. I also had a tail wind pushing me along and a good ground speed of around 55mph. I had a great flight of roughly 2 hours. My route took me over the Severn, skirting Filton airfield, over Yate, tracking south down the eastern side of Bristol below Bristol International Airports outer airpace staying below 3000ft, then down over Bath. I then turned East and pretty much tracked the Kennet and Avon Canal passing Melksham and Devizes keeping me South of Lynhams CTA and North of the danger areas on Salisbury plain. I particularly enjoyed seeing the white horses hewn out of the hillsides at Devizes and Alton Priors. Ground speed was good with a tailwind all the way I was doing 67mph plus which is good for my still air cruise of 59mph ish. During the flight I spoke with Filton Radar, Bristol Approach and Lynham for a “Basic service” just for traffic information and it’s also good practice if you fly close to zone boundaries, it keeps their radar operators calmer !Finally I tuned into “Popham Radio” as Newbury appeared on the nose with the unmissable huge expanse of the ex US airbase at Greenham Common alongside it. I turned South towards Popham and even this late in the day more were arriving. Popham attracts some 500 or 600 microlight aircraft each year and in the last few miles I heard maybe 10 aircraft all with a few miles of me and inbound. Keeping a good lookout is essential on Popham day. There was a little drama unfolding as I was about 10 miles North of the field. I heard a garbled radio call-”Popham, Golf – blah blah blah blah, mumble problem, attemtping a landing in field, engine failed…..” . The Popham radio controller called back and got a better position report I believe. A few mins later I heard “Popham radio, Helimed 03?” This was an air ambulance, the pilot said he was en route to a reported aircraft crash landing south of Popham. Then another pilot called up and said he had spotted the microlight in a field and that it appeared to have landed safely and people were out and walking about and didn’t seem to be in distress/injured. He said he would circle overhead so the Helimed could spot them and that he could also see fire engines arriving. I later overheard in the clubhouse that locals had seen it landing and assumed the worst and called the emergency services. No one was hurt and all was fine. I think out of 600 aircraft in the same area, one engine failure is good going and it also proved that training for emergency landings pays off, you can land safely without power. It’s also a good reminder that even if you dont bother calling the nearest air traffic control, being tuned to them can be of use if it suddenly goes very quiet behind you ! As I arrived overhead at 2000ft I could see several hundred aircraft parked below and as I descended on the dead side for a right hand circuit on 21 I had 3 aircraft ahead of me and 2 behind with more joining. Two years previously Andy Moore and I were number 7 on finals when we arrived. It’s like Heathrow on speed ! I made a nice landing and taxied and parked, a long way from where I landed as all the taxiways and space alongside were pretty much full of microlights of all shapes and sizes, plus the trade stands, food outlets etc etc. I had a nice few hours there spending some time with some old friends and there kids who had driven in to see what my hobby is about and catch up. The kids seemed to like the microlights, unlike we bigger children, little ones choose mainly by colour preference ! Ice creams went down well as did Oscar’s sitting in the Antanov’s cockpit. 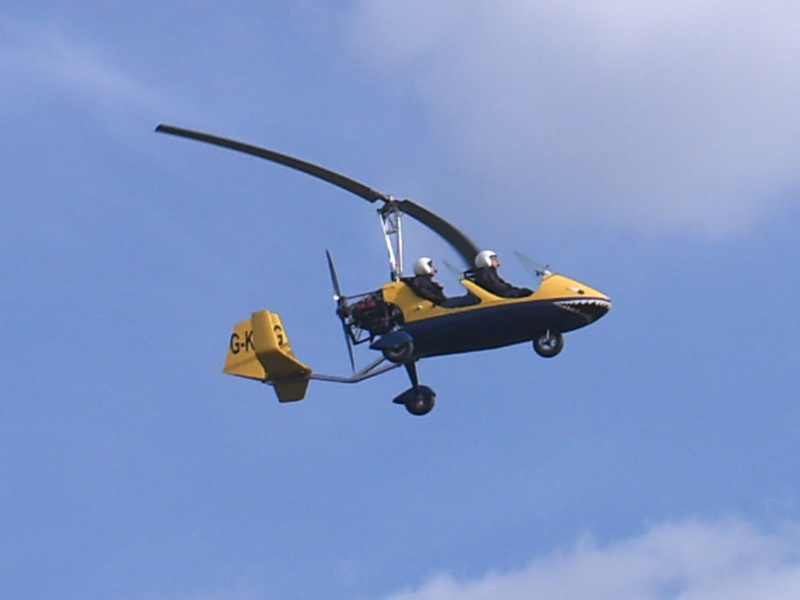 I also caught up with Paul&Tracy in his Tanarg and Alan C in G-BYFF the microlight I learnt on at Kemble. I’d have to get a flying suit that looks like a Tuxedo with bow tie. There’s a nice youtube video collection of photos from this year courtesy of microlightwings.com too, good work guys. 1700hrs soon came around and I wandered back to “red sparrow” feeling a little weary from the sun and ingesting some Tango to re-energise for concentration on the flight back. The wind had picked up and I calculated I’d be longer getting home as I’d be into the Westerly for most of my route and have maybe 7 litres fuel spare (30 mins), so bore that in mind and chose a couple of airfields to divert to if fuel burn was higher than expected. The return flight went nicely, smoother air and the early evening light is very pleasant on the landscape. I flew over canal boats on the locks near Newbury, several village cricket games, the white horses again and on towards Melksham. The wind was a full on headwind and despite trying various altitudes my GPS ground speed reading was only ever around 40mph unless I pulled the bar in and gave it higher revs. Mindful of the fuel and longer flight time I kept checking – fuel at Melksham slopping about at 15 litres, about 40 miles to go, about 1hrs fuel at the current ground speed, however I knew I was going to be turning onto a NW heading soon so wouldnt be fighting the wind so much and could drop into some shelter in the valley up alongside Bath ! Soon I was pasing the stunning Bath stone buildings in the slightly orangey evening light as the sun lowered. My ground speed had improved to around 53mph with the bar pulled in a tad, much better. Approaching Bristol from Bath I was treated to spectacular views of 4 hot air balloons, 2 skimming the field beneath me, 2 climbing up from Bristol somewhere. Fuel, slopping around a little above 10 litres ! 25 mins of track to go at 50mph cruise maybe, 45 mins of fuel, Ok, press on towards Filton and re-assess. Then the ever welcoming sight of the 2 Severn bridges and the silvery strip of Severn Estuary at full tide. Soon on the Welsh side, fuel slopping about between 5 and 10 litres ish, maybe 30 mins fuel? I climbed to 3000ft and over the ridge into the Usk valley, plenty of height for a glide if needed and now picking fields in case but quite happy I had enough to get to Kemeys. As I got nearer I decended out of the stronger wind and was soon on a straight in approach to runway 31 at Kemeys. A great day out, tired from 4.5 hours total enforced fresh air intake and several hours wandering in the sun, I packed “red sparrow” away and headed for the takeway ! Oh yes, before you ask, 7 litres left, maybe 30 mins. I’m still getting used to reading the eyeball fuel tank gauge rather than the dash mounted meter I’m used to. Next time I take a Gerry can to refuel and give a bigger margin ! Total fuel burn was 55 litres over 4hrs40mins so thats ~12litres per hour 1 up fighting a headwind, not bad at all.